Like in most sub-Saharan countries, railways in DRC have also played, throughout history, a key part in the economic development of the country by maintaining a dominant role in transporting freight and passengers at low cost. The DRC has two separate rail systems of strategic importance for the country: Chemin de Fer Matadi – Kinshasa (CFMK) and the Societe Nationale des Chemins de Fer du Congo (SNCC). There are two other rail networks in the Northeast of the country (Ubundu – Kisangani and Bumba – Mungbere) but these networks are of a relatively minor importance to the general economy of the country. CFMK operates the 366 km single track rail link from Kinshasa to the port of Matadi. The current track on this rail link is 30years old and in a reasonable condition. It is a major transport mode for imports and exports of goods between Kinshasa and the port of Matadi. Theoretically, SNCC operates an extensive networks centered on the Southeast of the country, connecting Sakania (Zambian border) via Lubumbashi to Ilebo in the west of the country. This rail link has for long been the life blood of the Congolese economy, transporting raw materials destined for export from the rich Southeast mining region towards the various ports, on the south (Port of Durban), or the west through Lobito in Angola or the far west through Ilebo to the Port of Matadi via Kinshasa. Unfortunately this network has progressively experienced major degradation over the past 20years due to lack of maintenance; making train operation unworkable. As a result, the bulk of raw materials emanating from the intense mining activities in the Southeast region is transported by road. versa. This has rendered the national railroad from the Southeast to Port of Matadi via ilebo / Kinshasa unviable. All these conditions have led to a sharp decline in railway traffic in the country. Despite the relatively good condition of CFMK’s track, its rolling stock has deteriorated and its quality of service has declined. In addition, the recent drive from the Congolese government to rehabilitate national roads from Kinshasa to Matadi and Lubumbashi to Kolwezi has fueled further to the situation and it is considered as a push factor to shift goods from rail to road; thereby further placing the rail away from its historical dominant position. While it is important to advocate for the revival of the railway in DRC, the very valuable role that can be played by river transportation should not be overlooked. 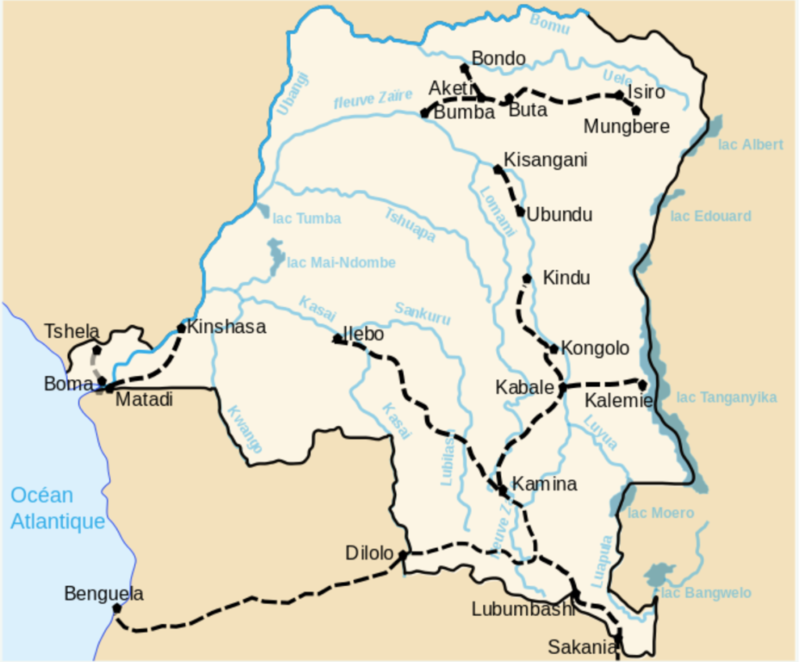 The vast Congo river traverses the DRC, linking three of its main cities (Kindu, Kisangani and Kinshasa), while its innumerable tributaries crisscross much of the country. Seeing that about 15,000 km of the Congo river and its tributaries are navigable, or potentially so, this mode of transport remains a vital complement to the future railway in development in the country.